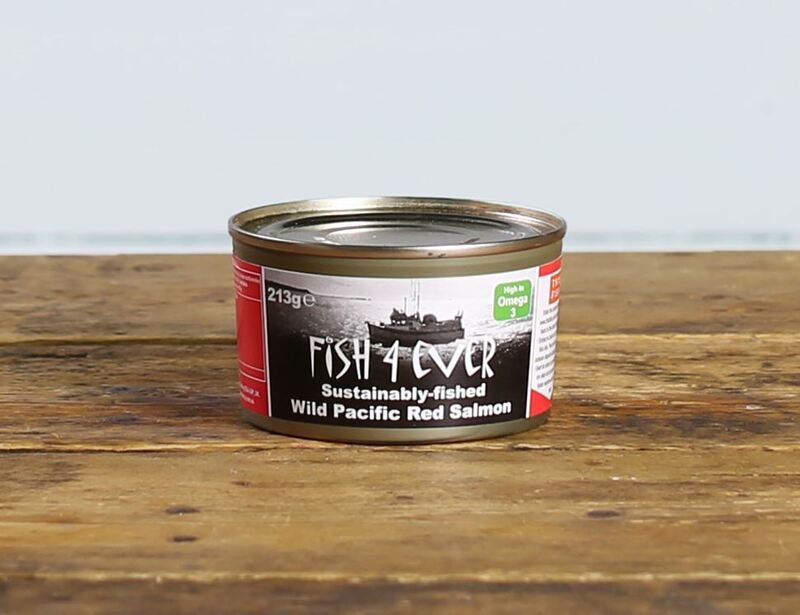 Fish 4 Ever’s sustainably caught salmon are tinned in their own juices to retain their rich flavour. This makes their firm texture and taste perfect for salads. Salmon is naturally high in omega-3 fatty acids, which help maintain normal blood cholesterol levels. Fish 4 Ever is the first and only range of tinned fish in the UK to promote explicit sustainability criteria. Fish 4 Ever do not endanger dolphins, turtles, birds, sharks or albatrosses. To top it all off, they also use organic, naturally grown land ingredients. Alaskan red salmon [fish], Salt * = produced to organic standards. For allergens, including cereals containing gluten, please see ingredients in bold. May contain traces of Crustaceans. Store in a cool dry place. Once opened, keep refrigerated and consume within 2 days. The salmon is ready to eat.